Kids adore inflated waterslides. On a hot day they will stay sliding on them for hours. In a garden with a slight slope the slides are a real treat. Alternately one needs a run up where the kids can run and dive onto the slide to splash down into the water pond at the end. Good quality bubble bath can be used on the slide to make it more slippery and create a foam slide effect. Please avoid using dish washing liquid as it is harsh on the skin yeas and on our Slides! Recommended ages: 2 to adult. Motor is a .75kw motor with a 15m extension lead. 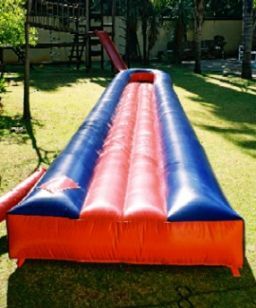 If the power point is further than 15m from where the slide will be placed, you will need to supply an additional extension lead. These are not provided by Party Animals.